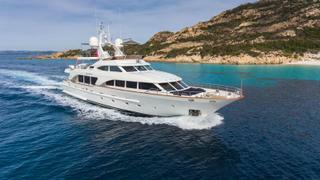 The 30.48 metre motor yacht Carlamaria has been sold with Antoine Larricq at Fraser acting for the buyer and seller. Launched in 2008 by Italian yard Benetti, she was built from a GRP hull and superstructure to RINA classification standards. Her exterior design is courtesy of long-time yard collaborator Stefano Righini, while Francois Zuretti created her refined interior décor. Carefully maintained by her original owner and only privately used, she benefits from a recent upgrade to the audio-visual equipment on board. Accommodation is for eight guests split across four generously-sized staterooms, including the main-deck master suite, which has been fitted with a King-sized bed, pop-up television and Jacuzzi, as well as three further cabins below decks. Meanwhile, the crew quarters can accommodate a staff of up to six people. On deck, guests are presented with a myriad of relaxation options including informal dining on the sheltered aft deck, a barbecue on the bridge deck or simply enjoying the view from the sundeck and its four large Gloster sunloungers. Moving inside through automatic double sliding doors, and the saloon area boasts an L-shaped sofa, pop-up television and coffee table. Further forward, the main dining area allows for formal meals around an eight-person dining table with discreet service from the nearby galley. Power comes from a pair of Caterpillar C18 engines that propel Carlamaria to a cruising speed of 11 knots, topping out at 14 knots.